IMAT Solutions announced today that it will exhibit for the second time at the annual Healthcare Information and Management Systems Society (HIMSS) Conference. 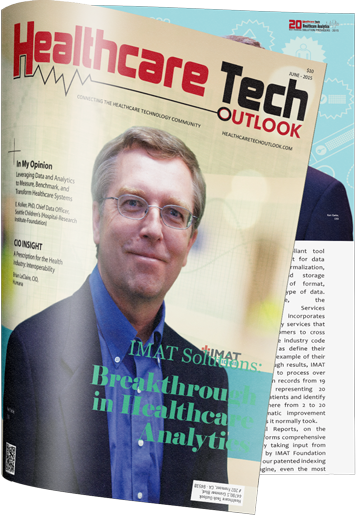 IMAT Solutions will showcase their Integrated Medical Analytics Technology (IMAT), a HIPAA-compliant solution for system-wide data aggregation, mining, and reporting. The technology enables large healthcare organizations to bring together and efficiently utilize ALL data housed throughout the community to better support meaningful use, improve clinical quality reporting initiatives, reduce readmissions, better structure preventative care measures, transition or work within an ACO, and more. Currently IMAT is being utilized by a number of statewide and regional health information exchanges, hospitals, and clinics. Within these enterprises, IMAT is being used by a variety of care providers and administrators across multiple facilities to increase quality outcomes, produce better accuracy in reporting and documentation, and increase overall sustainability throughout the organization. IMAT representatives attending HIMSS–including members of its executive and product management teams–are interested in meeting with HIEs and hospitals that need to enhance their ability to bring together and act on the disparate data housed throughout their communities. The 2014 HIMSS conference will take place on February 23-27 at the Orlando Convention Center in Orlando, FL. The theme for the conference is “Innovation. Impact. Outcomes. Onward.” IMAT will exhibit their Query Health Tools (IMAT Clinical Reports) and Data Access Framework (IMAT Data Warehouse) in conjunction with HEALTHeLINK at the ONC Interoperability Showcase booth #1234. IMAT will also exhibit system-wide data aggregation and reporting tools for improving health outcomes, achieving meaningful use, reducing readmissions, and more in booth #5678. Attendees wanting to schedule business development or sales meetings at the conference can email ray.connolly@perfectsearchcorp.com.